Recently we had the pleasure of hosting the birthday party of the current WBO Intercontinental and British Champion Brian Rose’ son Oscar! Everybody had a fantastic time during the party however, it was after the party the kids really did ROAR! 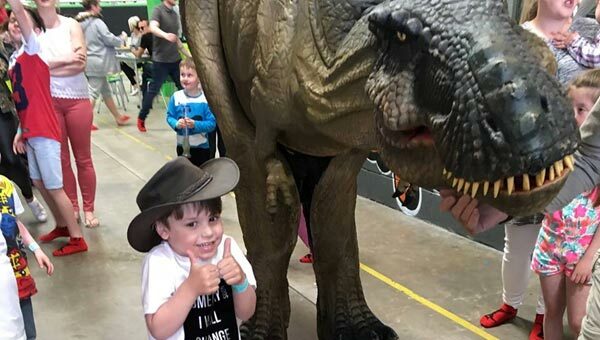 Oscar was asked to open the roller shutter door as he had a ‘friend’ on the other side…As the door slowly opened it was evident this wasn’t your average attendee! First it was the huge legs, and then a massive swinging tail and then…We was all astonished to see a giant Tyrannosaurus Rex. 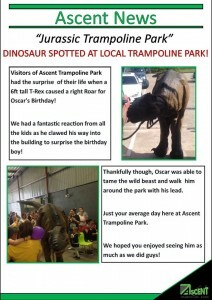 Rex’s trainer then then put a lead on him and let Oscar give him a full tour of the trampoline park before he posed for pictures with all the park attendees. Thanks for your visit Rex! And we all hope Brian and Oscar has a fantastic time.